You are probably wondering why there hasn’t been much talk about the modernization project, but I just want you to know the architects are working diligently on the construction documents. This is a time consuming phase and several tests still need to be performed, but as soon as we have more information for you, you can be sure I’ll be writing about it! Have you noticed the survey we have on our website and Facebook pages? If you haven’t taken it yet, I’ll make it easy to do right now: NMPL Survey It will take you 5 minutes, is only nine questions and will help us improve our services to you. An annual survey is part of our strategic plan to determine what we are doing right, what we need to change or improve, and any new ideas you may have for us. As of this writing, 102 people have answered the call, but we need your voice, too, if you haven’t yet had the chance. We have a new service! We purchased three Kindle Fires that can be checked out for three weeks at a time. For those of you who would like to see if a tablet is for you before you purchase one, this is a great opportunity. Also, if you have always wanted to try our ebooks, but didn’t want to read them on your computer or even your phone, check out one of these and see all the books available to you. Personally, I adore the smell and feel of print books, but a tablet can be propped up and the pages turned with a swipe of the finger, which is a real boon for these arthritic hands. Oh, and you can read with the light off, so when you fall asleep (as I always do when I read), you don’t have to wake up and turn off the light! Last but not least (don’t you love cliches – you always know what the next words will be! ), I am very happy to announce that NMPL will continue to offer the Foundation Center for two more years, due to the generosity of an anonymous donor. This is a wonderful database for individuals and nonprofits to access grants. 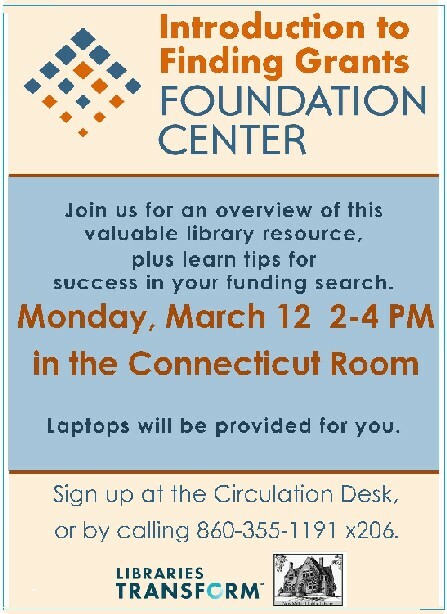 Search for grants specific to your needs, specific to your location, or specific to the grantor. 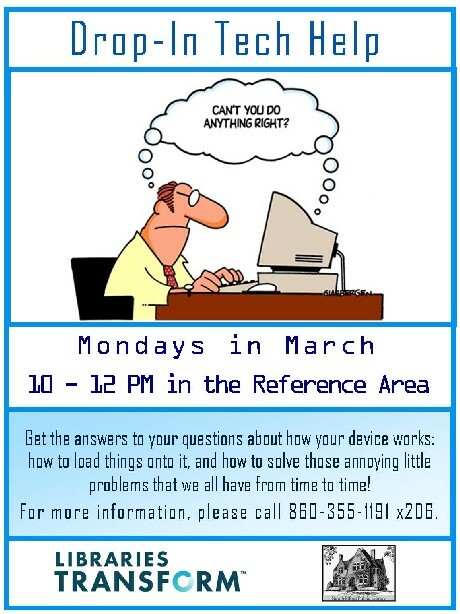 If you want to learn more about how to use it, we are having a workshop on March 12 at 2:00 PM, but seating is limited, so call now (860-355-1191 x2). If you can’t make that date, we’ll be offering more workshops in the future. However, the database can be used any time in the library at any of the public computers or you can bring your own laptop to access it. 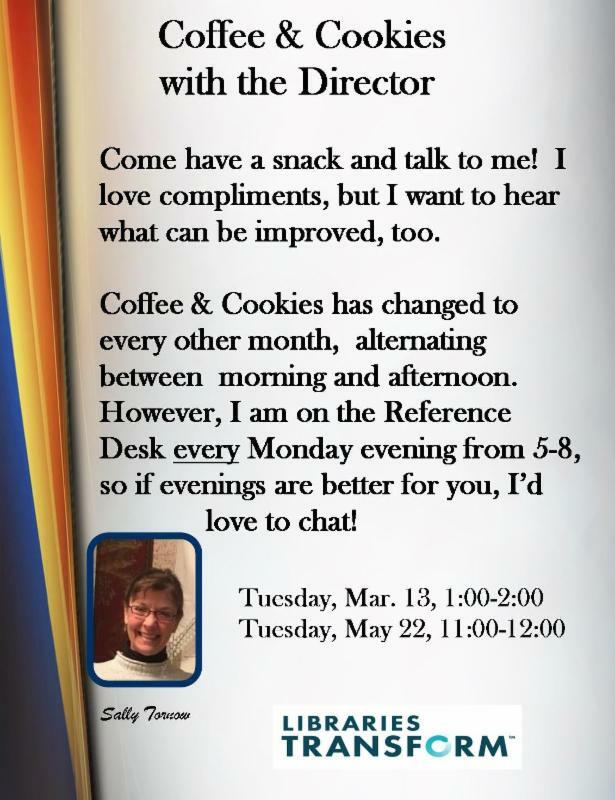 Don’t forget to have coffee with me on March 13th at 1:00 PM – I promise there will be a good snack, too! 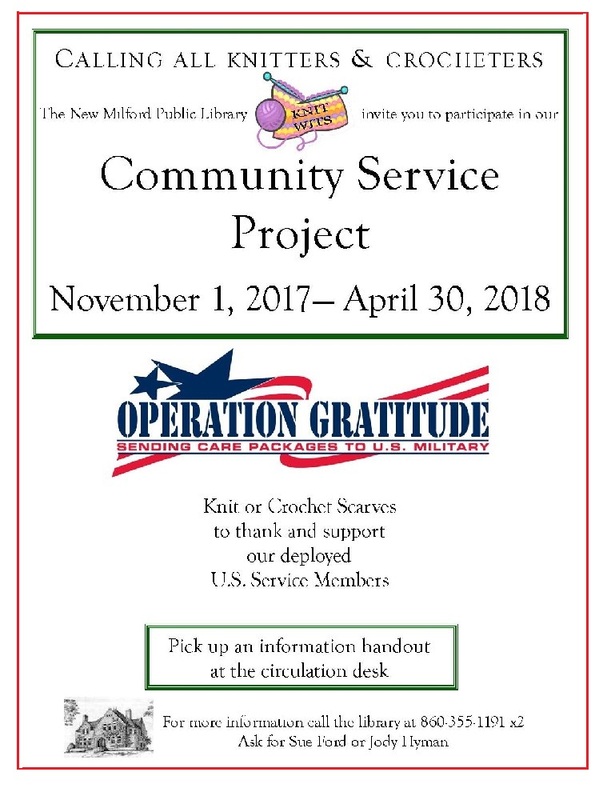 Only 2 more months to get your scarves done for NMPL’s Knit Wits group Community Service Project. So far, we have received a generous donation of 254 beautiful projectsr. So we thank all of our wonderful patrons for your caring efforts. Thank you! The scarves will be sent in several shipments over time, so please deliver your projects to the library as they are completed. For more information, please contact Sue Ford or Jody Hyman at 860-355-1191 x2. Starting this past September, we have been offering a new program here at NMPL called the “Homeschool Hot Spot”. We meet on Tuesdays at 2:00 PM, and spend about 1 – 1 ½ hours together. Usually I run the program, but when I am out, Mrs. Morin steps in for me. We read books, share information on what we have available to help you in your homeschooling, do a craft, and have time to share ideas/information with the other homeschoolers. Most of the families that have been attending have children in the preschool – 10 year old range. It has been lots of fun for me, as well as for the homeschoolers. If you are looking for an activity that will enhance your families learning, why don’t you join us! For more information, call the Children’s Department at 860-355-1191,ext. 3. Here at NMPL we think that technology is very important to our patrons. 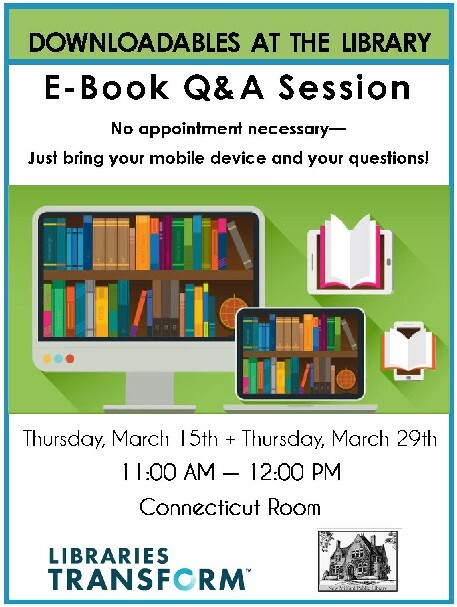 As these technologies change so quickly, we aim to answer some of the questions people have and we strive to also offer new features that we feel will benefit our patrons.For more information, please contact our Digital Literacy Associate, Rachael Schuster at 860-355-1191 x206. Molly Uskudarli has been paging at NMPL since 2009, first as a volunteer and now as an employee. After earning a BA in Archaeology, she went to the University of Rome, Italy, for two years to do post-graduate work in the field. She worked in international banking for 20 years and met her American husband who worked in the business as well. 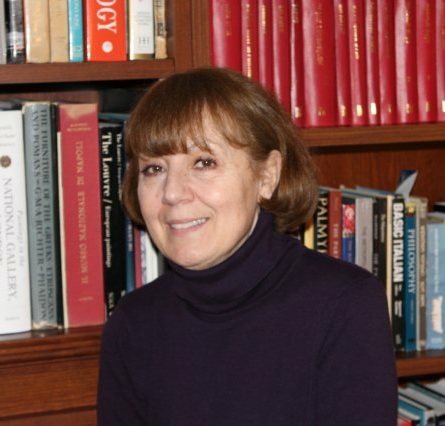 Later, she worked at a non-profit organization for ten years in Stamford, CT, in the donor relations and finance departments. Molly’s son and his wife and three children live in Southbury, CT.
Molly loves to learn, especially about art history! Currently she is working toward a BA in photography from WCSU. She subscribes to the American Journal of Archaeology and tries to visit the Metropolitan Museum of Art in NYC once a month. Molly also adores classical music and during the months of October through April, she watches operas-live from The Metropolitan Opera-at the Loews Theatre in Danbury. She also is a member of the New Milford Sports Club where she likes to swim several days a week. 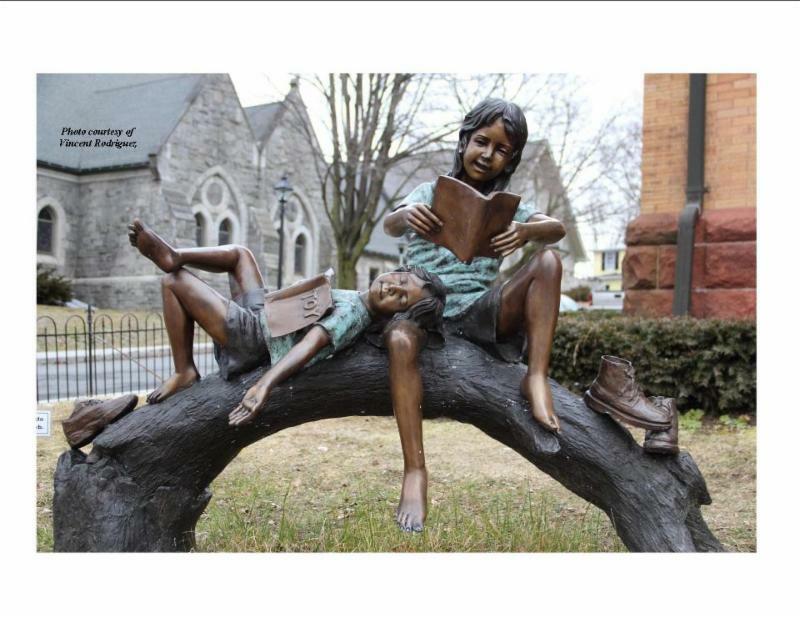 Molly collects antique art and history books and enjoys reading, especially biographies. Her philosophy is “Learn something new every day!” Stop in and ask Molly what she’s learning at NMPL anytime!